Tools to Find One Million Americans for Libraries! Take these next steps to help us find one million Americans for Libraries! Getting to one million is not going to be easy. We are really counting on committed people like you who already have taken the time to like us on Facebook to help us reach this lofty goal. We believe that you can make a big difference! If you want to get more involved here are a few things that you can do to increase our reach for this campaign and help make sure that we can reach and educate millions of Americans about libraries through our Facebook Page. The biggest thing you can do is to take the time to invite your friends and family through the “invite feature” on the EveryLibrary Facebook page. 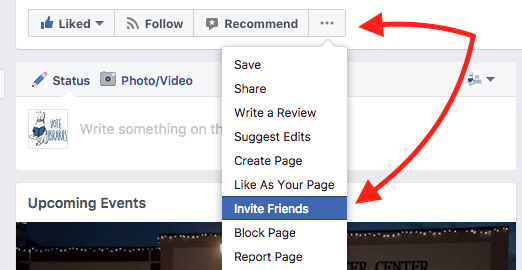 To invite your friends, just visit the EveryLibrary Facebook Page, click on the three dots “…” and then click “Invite Friends.” People who are invited by their friends and family to like our Facebook Page are much more likely to join us in this campaign. If you do invite your friends, please let us know on this page so we can send you some Vote Libraries art in the mail! Our amazing intern created these social media badges that you can use to easily promote the campaign by adding them to your social media profiles on Twitter and Facebook. Get involved and stay up to date with this campaign by joining our event page on Facebook. Here we'll be sharing new content and talking to you about what we can do to support libraries through this Million Americans for Libraries campaign. Copy and paste this into Facebook messenger and send it to your friends. There are people in the United States who are fighting to deny you access to your local public library. That’s why I just joined EveryLibrary’s campaign to find one million Americans who love libraries. I want to show my support for libraries in the United States and I’m challenging you to join me by liking the EveryLibrary Facebook page and sharing this message. Make a donation to help us ask more people to like the Facebook page. Every dollar we raise throughout this campaign will allow us find 10-15 real Americans who love libraries to like our Facebook page so your donations go a long way to reach more people. A one time donation of $25 will help us find over 250 Americans who love libraries. 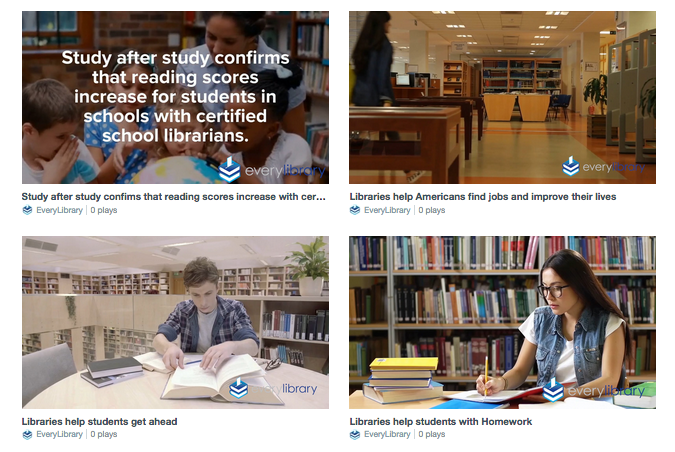 Share these videos that include testimonials from authors, campaigns, and short promotional videos about how important libraries are to Americans across the country. Share these images. We created this special set of 100 images that you can download and share across your social media pages. Each of these images includes text to ask people to join us in the campaign for one million Americans for libraries. By sharing them you'll get great content for your social media page, spread fantastic pro-library messages, and help us reach our goal.